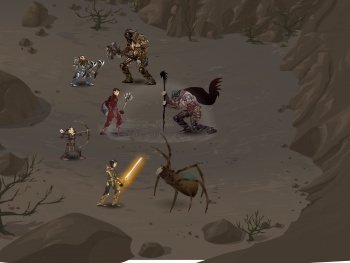 The first chapter of the official Dragon Age flash game has been released, and it's way deeper than anticipated. The Dragon Age franchise just keeps getting better and better, and its flagship entry Dragon Age: Origins hasn't even been released yet. Dragon Age Journeys: The Deep Roads, a free flash game that tells the story of the underground dwarven kingdom of Orzammar, is now available to play and is a much more absorbing experience than I thought it'd be. The game sounded tempting when it was first announced, but after playing it for an hour or so I'm already hooked. The Deep Roads is the first of three currently planned chapters, though it is divided up into five sections itself. After well over an hour of playtime, I've beaten the second section and recruited two party members. Upon starting the game, you create a character just like in Dragon Age: Origins, either a warrior, rogue, or mage, and then customize his/her looks and, later, abilities. Movement is similar to Diablo, with players clicking the mouse to traverse each area while collecting loot and items, but the enemies are static and only attack when approached. When you get close to an enemy, the game switches to a tactical battle screen that is exactly like Heroes of Might and Magic's. Battles have been pretty fun so far, with each enemy having its own unique abilities, including ranged attacks, trap setting, or the possibility to go berserk. Your own characters have statistics, spells, and their unique abilities as well, just like they do in Dragon Age: Origins, along with weapons, armor, potions, and other items to equip and use. The whole experience feels very deep and is definitely worthwhile as an appetizer for Dragon Age: Origins. In addition, players can unlock three items in Dragon Age: Origins by completing certain tasks in The Deep Roads. Completing a quest unlocks an item that boosts elemental resistance in Origins, answering three surveys about Dragon Age Journeys (that become available while playing) will impart an item that raises elemental damage, and aqcuiring all five of The Deep Roads' achievements will unlock the Helm of the Deep (+2 constitution, +10 mental resistance, +10 physical resistance). When these tasks are completed, the items are deposited into your EA account and unlocked later in Dragon Age: Origins once purchased. To learn more check out the BioWare Blog or just play Dragon Age Journeys at http://www.dragonagejourneys.com. This is definitely a must play for anyone into RPGs like Diablo or Heroes of Might and Magic, or just Dragon Age fans that have an unquenchable thirst for anything they can get. Dragon Age: Origins itself is coming to North America on the PC and Xbox 360 on November 3 (in Europe on November 6), and to the PlayStation 3 on November 17 (in Europe on November 20). UPDATE: BioWare just revealed that the PS3 version of Dragon Age: Origins will also be released in North America on November 3.